Indian Coast Guard is going to recruit fresher candidates in India for Navik (Domestic Branch) Posts. So, those candidates who are willing to work with this organization they May apply for this post. Last Date of Apply 16-February-2018. Total numbers of vacancies are Not Mention. Only those candidates are eligible who have passed 10th Class with 50% marks in aggregate from a board of Education recognized by Central/State Government. 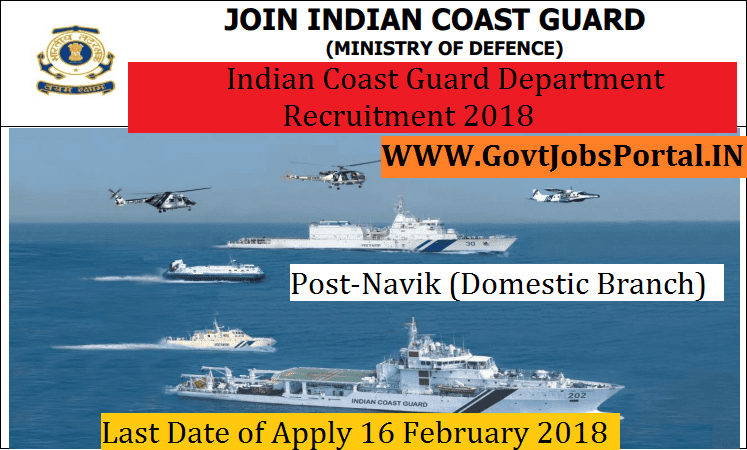 Indian citizen having age in between 18 to 22 years can apply for this Indian Coast Guard Recruitment 2018. Educational Criteria: Only those candidates are eligible who have passed 10th Class with 50% marks in aggregate from a board of Education recognized by Central/State Government. Age Criteria: Candidates age limit should to be possess minimum age 18 years & maximum age 22 years. What is the Coast Guard Selection Process job? 1: Selection will be held on Short-listing. 2: Selection will be held on written test. 3: Selection will be held on Physical Fitness Test.